Since university, I’ve had 10 staff jobs. THE HELLYER SAY: After the book came out, he fired us. Five of them, I quit. Four I got fired from. One, I haven’t quite figured out what happened. The weirdest firing, I have to admit, was from my first-ever magazine gig. I had been an editor at a Toronto-based company called Chimo Media just over three years when one afternoon, the owner, Paul Hellyer--yup, Canada’s former minister of defence--showed up to tell us that business was bad and several of us were goners. What made the day particularly memorable was that before lunchtime, I had taken a call from my landlord, a friendly Russian-Canadian senior citizen. He was so apologetic he was almost crying when he told me his aging wife could no longer manage the stairs at home, so they needed our apartment. My new wife Helena and I were evicted. And 50 percent of us was now unemployed. 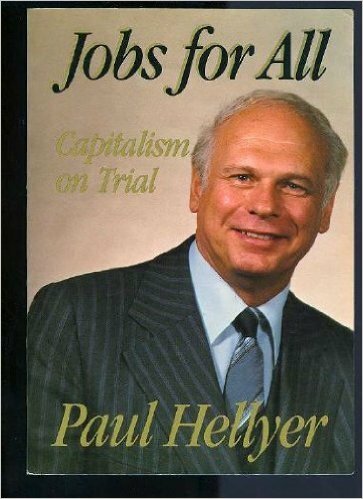 In all of the magazines that Chimo Media produced, we advertised an economics book that our civic-minded owner Hellyer had authored. The title? “Jobs For All.” (Look it up!) Written by the chap who fired us. Tip 1) Have Plans B, C, D, E, F’n G.
He’s right. If one outfit kicks you off the team, you need something else journalistic to do. It might be editing copy as assistant editor of the West Toronto-High-Park Shania Twain Fan Club newsletter, but for Pete’s sakes have another gig lined up. It’ll keep you grounded. But more important is the answer to this question: When I quote Doug quoting Fulford,whose brilliance are we tapping into? My friend Doug’s or that of the guy he cited? These are the important issues writers grapple with. Never mind whose employee you are. I’m deciding here and now. It’s Bennett. He chose the smart quote. That’s the kind of thing makes a terrific journalist. Doesn’t matter who he or she works for. Tip 2) If you’ve decided to quit, quit. Never mind how much you’ve had to drink. One job, I had to quit three times before it took. My very first newspaper position was at The Standard, a community paper serving several communities in Northern Ontario. Based in Elliot Lake. The publisher, Jon Butler, hired me between my third and fourth years at university. After that summer, I quit to return to school but 18 months later, I got a call. A few months passed with me back at the old job and then one evening, I—a single, skinny, long-haired, small-town newspaper reporter who’d barely done any travelling at all save to a few family funerals in various Canadian locales—got quite drunk with a guy named Mark, and decided we had to explore India, even if it meant quitting our jobs. I phoned Butler to tell him my plans. Turns out he was very curious about everything Indian and made me a counter-offer. If I filed a few stories from my travels, there’d be a job waiting for me when I got back. I returned and got the old job back where I stayed until I quit again. Mark never made it to India. Never quit his job neither. Then again, he’s not a writer. The India trip was one of the best things I ever did. And Butler one of the best bosses ever. Here’s a secret I can no longer keep. Growing up in our very book-friendly house in Sudbury, I learned from novels that women found male writers irresistible. Couldn’t keep their hands off them. I didn't quite understand why, but I’d be lying if I said this didn’t inform my career choice. Except … I never actually chose a "career." I know with certainty that I was in my mid 30s first time any of my journalism friends used the word “career” in reference to himself. Even then, I think he was trying to impress somebody. Career simply wasn't a thing. Writing was. Furthermore, I was well into my 40s by the time I realized that all those novels in which the male writer/hero was so attractive to women were written by—you guessed it—middle-aged men. All I know for sure is, I didn’t get into this business to work for anybody; I got into it because I wanted to—among other things—write. Tip 4) Document, Document, Document. If you do get fired, be sure to make careful notes of what people involved say and do. If you’ve ever been to court, you’ll know that meticulous note-taking is welcomed. I’m not suggesting you head for court. In fact, a date in front of a judge is the last thing I’d recommend. I once got fired in a schmozzle so illegal a lawyer guaranteed me if I sued, I’d win. But, he said, the case would take years. The company would dig its heels in, it had way more money than me, and even if I did emerge victorious, he said, lawyers would get a bunch of my dough. The worst part? As long as the case was before the courts, I couldn’t talk about it. Imagine, me not being able to talk about something. Yes, take notes. But not because of lawsuits. Take notes because that’s what writers do. You never know when you’re going to need them for a novel, a play, or a movie script. Or a blog.